Despite Hurricane Isaac disrupting Austal’s Mobile, AL shipyard operations for two days, the USNS Spearhead has now completed its performance and acceptance trials for the US Navy. Successful completion of the trials means the Navy should soon be accepting the first of 9 Joint High Speed Vessels (JHSV) into service. The second ship in its class, USNS Vigilant, is set to be christened September 15th. The JHSVs were designed to act as fast transports for deploying US servicemen throughout the world in support of combat and humanitarian missions. Austal, the winner of the Navy contract for design and construction of the vessels, drew upon its experience building civilian catamaran ferries to produce the ship. The JHSV can embark 312 troops in airline style seating and has on-board berthing for 150 plus 41 crew. Its rear loading ramp can accommodate vehicles up to the size of an M1A Abrams tank and can operate a single helicopter off of its landing pad. The JHSVs are designed to operate in austere conditions and can disembark their troops and cargo without advanced port facilities. A single JHSV can move a Marine or Army company with all of their equipment or an entire battalion if operating solely as a troop transport. 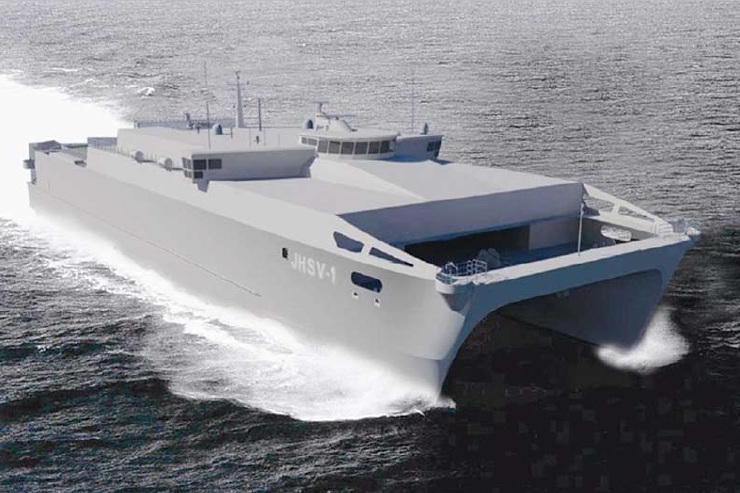 Additionally, the vessel can transport troops and equipment 25% cheaper than an airlift operation and around 50% faster than current seaborne options.